The Deaf and Hard of Hearing Specialty Program at Minute Man Arc Early Intervention is dedicated to providing family-centered services, information, and support. The communication approach emphasizes listening and spoken language. Visual supports include English-based sign language, gestures, pictures and speechreading. Communication strategies are specific to each child's unique needs and may change over the course of the IFSP period. Strong parental involvement in all aspects of the program results in the best outcomes. a weekly sign language class. 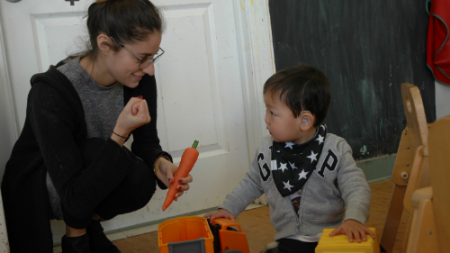 Parent-Child Playgroup: This is a comfortable and supportive environment in which to navigate the challenges of raising an infant or toddler with hearing loss. It provides education for parents regarding hearing loss and an opportunity to learn from each other as they move forward. The program is led by a Social Worker and a Developmental Specialist. Parents participate in the group with their child. This group is appropriate for children from birth to approximately 20 months. Toddler Playgroup: The playgroup is a curriculum-based, dynamic, and language-rich environment with a high staff-to-student ratio. Toddler Playgroup is staffed with Developmental Specialists, Speech and Language Pathologists, a Physical Therapist and a Teacher of the Deaf. Progress is tracked according to individualized goals for each child. The sessions include child-centered play as well as directed activities intended to facilitate all areas of development, with a focus on auditory, speech and language skills. 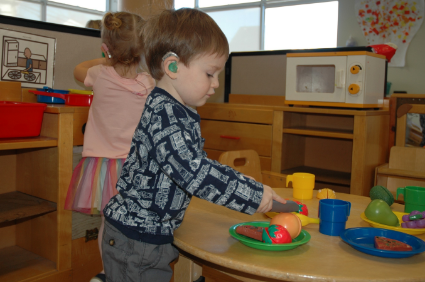 Accommodations and classroom modifications assure the best access to speech for children with hearing loss. This includes the use of a sound field system for whole group circle, art activity, and snack time, and personal HATS (Hearing Assistive Technology Systems) for children as they approach transition out of Early Intervention. This group is recommended for children from approximately 20 months to 3 years of age. This Playgroup meets twice a week; for maximum benefit, we encourage children to attend both days. Individual Therapy: Speech/language/auditory therapy is provided for each child with a hearing loss either once or twice a week, based on the child's individual needs. Parents participate in these therapy sessions. Parent Group: The parent group meets each Wednesday during playgroup to discuss the unique issues involved in raising a child who is deaf or hard of hearing. Parent group includes parents from Toddler Playgroup and Parent-Child Playgroup. The facilitator is a Social Worker who has significant experience working with parents of children with hearing loss. Topics for discussion are based on the group's preference and interests and may include language methodology, transition to preschool, amplification and technology, evaluations and therapy services. Guest speakers may be invited to share information on topics of importance to the group. 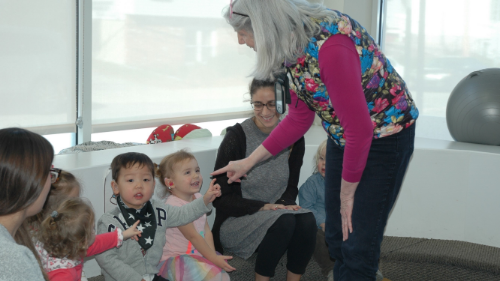 Sign Language Class: In the weekly sign language class, parents and other caregivers, learn vocabulary from the language curriculum used in the Parent Child Playgroup and Toddler Playgroup settings. Instruction in sign language is intended to support spoken language and is offered during the Friday parent group. Participation in Parent Group and Sign Language Class is strongly recommended so that families can receive the greatest benefit from the program. A transition specialist is available to assist parents in navigating the process of working with their school district to determine appropriate preschool programming for their child. Enrollment is initiated by parents or providers and can occur throughout the year. Children enrolled in any Early Intervention Program in eastern/central Massachusetts may enroll in this specialized program upon completion of a waiver from the Department of Public Health. Inquiries should be made to Linda Roth at 978-287-7820 or lroth@minutemanarc.org. The program is available at no cost to families of children who qualify for Early Intervention services. Funding for the program is provided by insurance companies, Mass Health and the Massachusetts Department of Public Health. The program also receives financial support from The Decibels Foundation, a registered 501 (c)(3) non-profit organization which is dedicated to sponsoring this program and assuring that support for this population continues as children transition into school. Meet the staff of the Deaf and Hard of Hearing Specialty Program here. Supporting Success for Children with Hearing Loss, Karen Anderson's Website - http://successforkidswithhearingloss.com/ Click the "Resources" tab for many great and informative articles. Click on the links below to access informative articles.